Burning our 12" tall pillars will give you many hours of candle light. BeeswaxCandleWorks.com uses only 100% pure USA beeswax in all of its candles and pillars. No other waxes are put through our wax tanks, just beeswax, plain and simple. 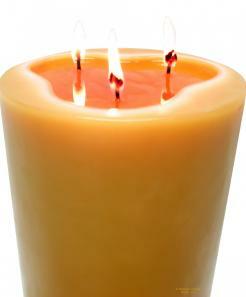 For burning suggestions on our natural beeswax pillars, please click on this link, Burning Beeswax Candles.